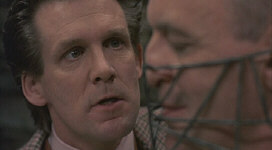 Studio Line: MGM - The only way to stop a killer is by going in to the mind of a madman. Anthony Hopkins and Jodie Foster deliver sensational Oscar®-winning performances in this "shockingly powerful thriller" (New York Magazine). "Stunning" (Los Angeles Times) and "spellbinding" (The Hollywood Reporter), this terrifying masterpiece garnered five Academy Awards®, including Best Director and the coveted Best Picture. A vicious psychopath is murdering women throughout the Midwest. Believing it takes one to know one, the F.B.I. 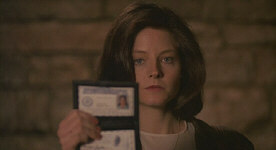 Sends agent Clarice Starling (Foster) to interview a prisoner who may provide clues to the killer's actions. That prisoner is Hannibal Lecter (Hopkins), a brilliant, demented cannibal who agrees to help Starling only if she'll feed his morbid curiosity with details of her own complicated life. But as their relationship develops, Starling is forced to confront not only her own hidden demons… but also an evil so powerful that she may not have the courage - or strength - to stop it! 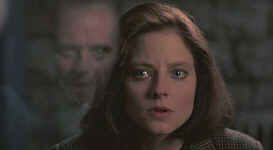 Awards: Won for Best Picture; Best Director; Best Actor-Anthony Hopkins; Best Actress-Jodie Foster; Best Screenplay. Nominated for Best Sound; Best Film Editing. 1992. DVD: Widescreen 1.85:1/16X9; audio English Dolby Digital 5.1, French Stereo Surround, Spanish Monaural; subtitles English, French, Spanish; closed-captioned; single sided - double layered; rated R; 28 chapters; 118 min. ; $29.98; 8/21/01. Supplements: “Inside the Labyrinth” Documentary; Deleted Scenes; Original 1991 Featurette; Outtake Reel; Photo Gallery; Trailers; TV Spots; Collectible Booklet. As I've whined in a few other reviews, Oscar and I have a strained history. It all started in 1975 when the Academy failed to bestow its Best Picture honor on my fave, The Towering Inferno. For the record, I no longer actually argue that Inferno should have bested Godfather 2, though my seven-year-old self felt otherwise; hey, I have a soft spot for Inferno, but not a soft head. That horrible incident set the stage for many years of crushing disappointments, in life as well as on Oscar night - not that I'm bitter or anything. Jaws lost to One Flew Over the Cuckoo's Nest. Star Wars fell to Annie Hall. Raiders of the Lost Ark dropped by Chariots of Eggs. And then the final blow: the absurd victory of Gandhi at the expense of E.T. Oscar made a slight improvement in 1985 when Amadeus - a movie I actually liked a lot - won, but after that it was back to the loser parade for me. This reached its nadir again when Scorsese's marvelous GoodFellas lost to the pretentious Dances With Clams. After that bitter defeat, things could only go up, and they did. For 1991, the Academy picked the most improbable Best Picture winner since Midnight Cowboy and its "X"-rating: Jonathan Demme's The Silence of the Lambs. To say that Lambs didn't look like typical Oscar-bait is an understatement; this was essentially a thriller/horror film, after all, and it included some fairly graphic scenes. Frankly, I felt astonished that it even received a nomination, though the Academy clearly felt somewhat frisky that year; they also nominated an animated film - Disney's Beauty and the Beast - for the first time ever. It was an odd year for my Oscar rooting interest as well, since I actually would have been happy if any one of three nominated films won. Lambs, Beauty and JFK were all movies I really liked and I would have cheered the victory of any of those choices. Heck, all five options were solid; I didn't want them to win, but Bugsy and Prince of Tides were also very good films. In retrospect, I've done a complete 180 on JFK, largely due to its callous manipulation of history. I still like Beauty a lot, however, and Lambs has only come up in my eyes. It wasn't my first choice during the 1992 award ceremony, but I now see it as clearly the best picture of 1991. Lambs offers that rarest of beasts: a thriller that remains tremendously compelling despite repeated viewings. Usually this sort of film goes flat when you see it again; after all, when you know all the plot twists, what's left to enjoy? However, as with semi-soulmate Se7en, Lambs easily rises above its genre; it's so incredibly well-executed that it stays fascinating even through many re-screenings. Also like Se7en, Lambs creates an immensely creepy atmosphere that pervades virtually every frame of the film. One time a few years ago I tried to eat a snack while I watched it but I discovered I couldn't do it without feeling sick. This isn't because Lambs is a terribly graphic film; while it shows some unpleasant sights, the movie actually depicts surprisingly little violence or gore. No, my nausea simply resulted from the general aura of the film; director Jonathan Demme so absolutely infused his production with this atmosphere that discomfort was inevitable. In addition to Demme's masterfully created aura, the film owes much of its long life to the terrific acting. While I'm not sure Jodie Foster actually deserved an Oscar for her role as FBI agent-in-training Clarice Starling, there's no question that she ably inhabited the part. She adds a few too many self-consciously showy flourishes for my liking - such as the way she repeats "wrongful death" while examining a victim - but Foster nonetheless remains true to the character and makes her a surprisingly real and three-dimensional person. 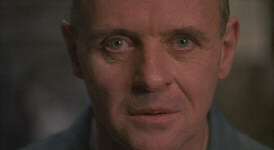 As Hannibal Lecter, Anthony Hopkins attempted no such thing, and we're all much happier because of that. 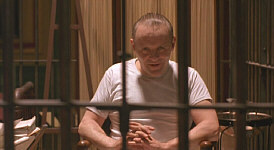 Make no mistake: Lecter is a cartoon, a broad theatrical creation that bears no resemblance to any actual human being. And so what? Hopkins so magnetically and fully brings Lecter to magnificent life that no one cares how flamboyant he is; Hopkins offers one of the most compelling and memorable performances in years, so damn the fact it's not realistic. Hey, not everything has to be 100 percent true to life, and Hopkins displays how exciting and vibrant a "movie monster" part can be in the hands of a talented actor. In fact, Hopkins provided such a stunning turn that he received the Best Actor Oscar even though the role should have qualified only for Best Supporting Actor. Lecter appears in only about 25 percent of the film, but it's a tribute to Hopkins that we think he's there for much more of it. The aura of Lecter pervades the movie so strongly that it almost becomes a fault; we are so drawn to him that we occasionally forget Buffalo Bill (Ted Levine), the actual target of the film. 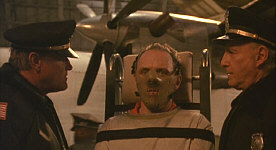 The Silence of the Lambs is not a perfect movie, but it certainly delivers the goods. Demme made a film that seems to grow in stature as time passes. To this day I remain stunned that the Academy, the pretentious windbags who normally select whatever gassy "epic" appeared that year, chose a movie, not a film, as their Best Picture of 1991. Good for them! 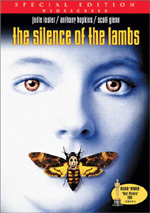 The Silence of the Lambs appears in an aspect ratio of approximately 1.85:1 on this single-sided, dual-layered DVD; the image has been enhanced for 16X9 televisions. A fullscreen version of Lambs also has been produced, but only the widescreen edition was reviewed for this article. Objectively, this new edition of Lambs seemed to improve upon the older DVD releases; this is the film’s third release in the format, following a 1997 version from Image Entertainment and a 1998 Criterion edition that essentially rehashed a 1994 laserdisc. I never saw the former, but I did check out the latter, and thought it was a flawed representation of the film but one that seemed to be consistent with prior viewings of Lambs. The MGM DVD appeared to alter the experience in many ways. As I mentioned, from an objective viewpoint, the changes seemed to be positive. The picture looked consistently crisp and detailed, as I discerned virtually no examples of softness. I saw no problems related to moiré effects, jagged edges, or edge enhancement. However, the film did provide an excessive level of print flaws, as was also the case for the prior Criterion release. Mainly I saw lots of speckles, as they cropped up frequently. Otherwise, the movie betrayed a little grain, some scratches and a couple of hairs, but speckles remained the primary culprit. Lambs offered a rather restricted palette but the colors seemed fairly well-reproduced. This was another area in which the new DVD outdid the old one. The Criterion version had problems with the red lighting in the asylum, but the MGM release handled them cleanly. Overall, the colors looked clean and accurate, though ultimately quite subdued. Black levels came across as dark and solid, while shadow detail was clear and easily discernible. As I noted, the MGM DVD provided a cleaner and more distinct visual experience than I’d seen for Lambs. So why did I feel dissatisfied with it? Frankly, I thought the image looked too clear for this film. The movie seemed to be considerably brighter than past releases, and I didn’t regard that as a positive. Lambs should feature a certain aura of dread about it, and this release didn’t conjure that impression. The new image lacked the character found in the older one, and without that atmosphere, the movie felt less oppressive and disquieting. I’m not usually one to justify an uglier visual experience due to “character”, but this was the first time I’ve watched Lambs and it didn’t unsettle me. My impressions in this domain remain solidly subjective, but to be honest, I’ll stick with my old LD of Lambs for future viewings because I thought it better conveyed the appropriate atmosphere absent from the MGM DVD. I also preferred the older soundtrack. The MGM DVD offers a newly remixed Dolby Digital 5.1 edition that essentially replicated the soundfield of the original Dolby Surround 2.0 version. The front soundstage was quite broad and added a lot to the experience; music and effects were consistently spread out across the front speakers, and I also heard some dialogue from places other than the center. Though the track advertised 5.1, I discerned no signs of split-surround usage. The rear channels seemed to remain monaural, and they stuck with music and effects, though they did so adequately. The surrounds contributed some decent atmosphere at times, although they were junior partners in the mix. The area in which the two tracks mostly differed related to audio quality, though many of those elements seemed similar as well. Dialogue appeared to be easily intelligible but slightly rough, as the speech betrayed a somewhat hard-edged and metallic tone at times. Howard Shore’s score also appeared somewhat harsher than it should, though the fidelity was decent. Effects came across as the most natural and realistic parts of the mix, but they still appeared somewhat thin and bland. In comparison with the old release, the dynamics of the soundtrack were where I really heard the biggest differences. The 5.1 mix sounded rather flat and sterile for the most part, as it offered little depth and spatiality. On the other hand, the 2.0 track was quite rich and warm, and it possessed some excellent bass response. I directly compared the two, and the differences were significant. The ominous rumble during much of the film came across clearly in the 2.0 version, while the 5.1 edition sounded lifeless and cold. Again, this altered the effect of the film for me, as Lambs became a much less effective work with the lackluster soundtrack. On its own, the 5.1 mix was good enough to merit an objective “B-“, which wasn’t lower than the objective “B” I gave to the Criterion DVD; for such purposes, I took each on its own merits and compared them against a theoretical “average” soundtrack from the era. However, subjectively, I greatly preferred the old mix, as it packed a strong punch and greatly reinforced the movie’s aura. 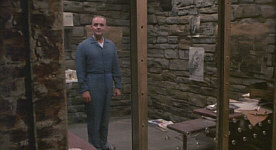 Another area in which the new MGM DVD of The Silence of the Lambs differs from the Criterion release relates to its extras. Virtually all of the material from that DVD fails to appear here, with the most prominent omission being the Criterion’s excellent audio commentary. Unfortunately, the MGM release offers no new track of that ilk. Instead, however, we find a new and very good documentary called Inside the Labyrinth. This 63-minute and 10-second program consists of the usual array of film snippets, shots from the set and interviews with participants. The latter category provides the strongest elements, as “Labyrinth” packs in a wide variety of folks. From the movie’s production circle, we hear new material from producer Ron Bozman, screenwriter Ted Tally, former Orion Pictures VP Mike Medavoy, production designer Kristi Zea, composer Howard Shore, set dresser Ken Turek, set decorator Karen O’Hara, art director Tim Galvin, special makeup effects Carl Fullerton and Neil Martz, costume designer Colleen Atwood, editor Craig McKay, production sound mixer Christopher Newman, moth wrangler Ray Mendez, re-recording mixer Tom Fleischman, sound designer Skip Lievsay, and actors Anthony Hopkins, Roger Corman, Diane Baker, Brooke Smith, Anthony Heald, and Ted Levine. In addition, we also get recent comments from film critic Amy Taubin and transgender activist Vicky Ortega; more about the latter later. Remarks from actors Jodie Foster and Scott Glenn appear via 1991 interviews, while director Jonathan Demme remains totally absent. The failure of the last three folks to appear in the new material offers this program’s only disappointment; while we hear from a slew of others, those three are awfully important omissions. However, I honestly barely missed them during this entertaining documentary. Very few stones were left unturned as the piece neatly cut through all manners of the film’s production. It gave a fine overview of the various elements, and it even went into the movie’s aftermath. I had totally forgotten about the misguided protests leveled against Lambs by gay and lesbian groups; they complained because of the film’s evil homosexual villain. Unfortunately, that wasn’t the case; never was Jame Gumb described as gay. Sure, he was viciously misogynistic, and a crossdresser, but as Ortega explains, that doesn’t make him gay, and Gumb’s sexual preferences play no part in the film. Anyway, that dimension of the documentary shows how detailed it was, and I thought it was an enlightening and entertaining piece. In addition, we get an eight-minute and five-second Featurette that stems from the original release time frame of Lambs. This brief piece focused on interview snippets from Hopkins, FBI agent John Douglas and another unnamed FBI dude plus the three missing from the new show, Demme, Glenn, and Foster. Obviously the program’s brevity meant that it couldn’t provide much depth, but it still offered a good experience. We learn some details absent from the longer show, mainly due to the extra perspectives heard; only Hopkins appeared on both, so much of that information didn’t make it to the new show. It’s a somewhat insubstantial piece, but I liked it nonetheless. The next big attraction is a collection of 22 Deleted Scenes. Although the Criterion DVD also included excised footage, the two duplicate little material. As such, a lot of the MGM disc’s snippets are quite valuable. Eight of them are referred to as “excerpts”, which essentially means that they’re just tiny snips from various segments. Some are also just alternate takes of existing scenes. However, a number of them are totally new, and these are the most useful pieces. They were quite fun to see, even if none of them really needed to be in the film. Speaking of unused material, we find a 105 second Outtake Reel. This offers the usual mix of flubbed lines and goof-ups, which I usually don’t enjoy. However, in this instance, I made an exception, mainly because it was so odd to see semi-lighthearted footage from the dour Lambs set. Another unusual extra comes via the Anthony Hopkins Phone Message. This brief piece provides an outgoing answering machine clip. I don’t know if Hopkins actually had this on his service or did it for a friend or performed it just for promotional purposes, but his Lecter bit is entertaining to hear. The Photo Gallery splits into eight subcategories. These offer from five to 20 images apiece for a total of 118 stills. The pictures mix the usual array of shots from the set with movie frames and publicity photos, and they offer a decent lot if you like that sort of thing. In addition to a very good eight-page booklet inside the DVD’s case, we find a mix of promotional materials. We get the movie’s original trailer plus an ad for the DVD release of Lambs sequel Hannibal. We also discover eight TV spots for Lambs itself. This mix of extras won’t make anyone throw away their old Criterion DVDs, but the two packages nicely complement each other. Unfortunately, I think that the prior DVD offered a better film experience. I continue to love The Silence of the Lambs. After more than a decade, it’s lost none of its power or perverse charm. However, I felt less enamored of this new DVD. While it seemed to provide a clearer image, I thought the picture appeared too clean at times, and it lost much of the film’s creepy atmosphere. The same went for the somewhat thin and lifeless Dolby Digital 5.1 soundtrack, which added less punch and ambience to the affair. The DVD includes a nice mix of extras, though, which will be enough for serious Lambs fans to want to grab the new disc. For those who don’t already own a DVD of The Silence of the Lambs, they’ll have little choice. The Criterion disc is out of print and it fetches high prices at auction, which makes it an unrealistic option for most. I can’t say that I was so dissatisfied with the new DVD that I wouldn’t recommend it, but I will prefer to watch my old LD instead of it. Despite the advantages offered by the movie’s new anamorphic transfer, I think the prior version better represents the film. Subjective or not, I think it works better, though others may feel more satisfied with the cleaner, brighter image of the new DVD.